On the face of it, former Media Advisor to the PM, Sanjaya Baru's book, "The Accidental Prime Minister" does not contain anything new. It is common knowledge that Prime Minister Manmohan Singh was almost subservient to the Congress President Sonia Gandhi. However the book gives us never before insights into the extent to which the PMO's authority was completely eroded during his tenure. Some things mentioned in the book are quite startling. "Principal Secretary in the Prime Minister's Office (PMO) had regular meetings with Mrs Gandhi, and sought her instructions on important files to be signed by the PM." When Sonia Gandhi, in an extraordinary show of selflessness, did not accept the PM's post after the Congress' astounding victory in 2004, though some saw it as a supreme sacrifice, many people suspected that it was because she wanted power without the accompanying responsibility. This book proves it beyond doubt. For the PMO to be sending files to her for 'instructions' makes me feel embarrassed and angry at the way this august office has been insulted during the last ten years. The other significant aspect that was brought out was the way the ministers in the cabinet treated the PM. Pranab Mukherjee, in his stint as External Affairs minister did not brief the PM after important meetings with foreign dignitaries. The PM had no clue on what was happening in such an important ministry! Important portfolio allocations were done without even consulting him. Many other such instances have been documented in the book which leave us ashamed at the way our Government has been functioning all these years. Any self-respecting person would have resigned when he realised that he was no more than a puppet. Unfortunately Manmohan Singh will go down history as one of the weakest Prime Minister India had. He was also probably the most honest. However, it is not enough to be honest when you are occupying the Prime Minister's chair. It is important to be strong and decisive. This facet of his tenure is likely to be overshadowed by his weakness. Sonia Gandhi has done a great disservice to the nation by insulting the authority of the PM. She has shown that the Gandhis cannot allow others in the Congress to exercise their authority. She has shown that the Gandhis want complete power, power without the responsibility. In what seems to be an election where the Congress is likely to come up with their worst ever tally, it is unlikely that she or the Congress will learn any lessons. Servitude and a sense of entitlement are in the DNA of the Congress worker and the the first family. And DNA takes more than one election to change. A few days ago, I was reading news paper and find a cartoon there, that was the time when Academy Awards were announced and in that cartoon it was mentioned that our three big politician were floating in the air (representing the success of the Oscar wining movie "gravity) and one person on the ground showing similarity with our PM was appearing very happy with a trophy in his hand and it was mentioned 10 years a slave (representing the 10 years tenure of Dr. Singh as PM in NDA1 and NDA2). On that day I smiled but after reading this book, I do not have smile on my face but little bit happiness (I do not know why?) and sympathy for Dr. Singh. 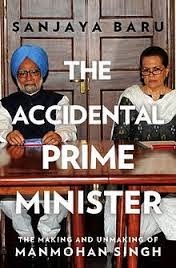 Before reading this book, I has an opinion that Dr. Singh has disgraced his dignity and strength, for the loyalty for Gandhi family but now since the facts have come out in an unfashionable manner, I am happy that at least he was not fully comfortable with what he was doing since last 10 years as PM of this country. The book has been written in very interesting manner, You will find that you are reading a TV serial and good thing is that this book talks about the people who are alive and are with us in the politics of the country. Well the timing of this book is slight late, I wish the things mentioned in this book could have been discussed publicly before the election. I know opposition will try to make its own benefit from the content of the book but the thing is that we all know that the power switch of the government was not in the hand of Dr. Manmohan Singh but in the hand of other person. I am sure that now Dr. Singh will be feeling relaxed, as this is something that even he would be thinking to make public for keeping his position clear. But again the last question from Dr. Singh, why you allowed this all rubbish to happen ?